LoveSick Radio (LSR) brings a unique blend of unapologetic rock coupled with pop melodies and a little hip-hop swagger, creating a fresh sound all their own. The band formed in 2006 in Columbus, Ohio and now call Las Vegas home. With their high-energy live show, the band has opened for acts such as Bon Jovi and Kid Rock,hit the stage at festivals including the July 2012 Vans Warped Tour and, most recently, the Changjiang International Music Festival in China this past April. During LSR’s initial jam session in 2006, it was apparent that they all shared the same goals: intertwine all of their musical influences and views on life, love and death to sonically communicate to an audience in a way that couldn’t be forgotten. The chemistry was instant as front man Justin Theriault (TERI-O) and guitarist Dave Harris inked two tracks in their first meeting. Along with bassist Josh Masters and drummer Scott "Smalls" McCann, LoveSick Radio hit the ground running and never slowed down. Playing more than 200 shows a year on their own, LSR held opening spots for Bon Jovi, Kid Rock and The Fray. The band has performed at the most buzzed about festivals and events, sharing the stage with the likes of David Cook, Justin Bieber, Blue October, White Tie Affair, Rooney, Three Days Grace, Hinder, Safety Suit and New Found Glory. In July 2012, they rocked the stage at the Vans Warped Tour. Even with a multitude of live shows, the band found time for two tours overseas to perform for our troops. 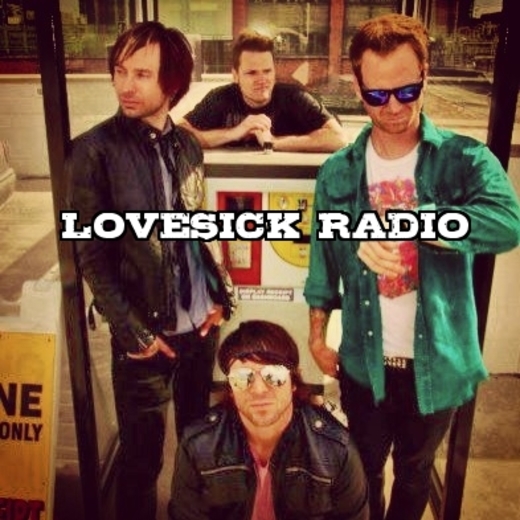 Thanks to LoveSick Radio’s road work and live shows, the band boasts a strong, loyal fan base. The band relocated to Las Vegas in 2012 to write and while currently working with producer Warren Huart (The Fray, Aerosmith) on new tracks for a forthcoming album.